Christine Kettaneh, Hayat, 2017, cold press bright paper, ed .3 /4: Hayat old ad, 40x14cm, Hayat old stamp, 40x53cm, How do you carry life?, 40x48cm. Christine Kettaneh Solo Show, Gagliardi e Domke, Turin. I fished for inspiration in the book “100 years of Lebanese Press” and found it in an advertisement for the soap Hayat, dating back to the 1950s. I soon discovered that Hayat still existed. The soap was still being made in Tripoli. I visited the factory Saboun s.a.l, the current producers of Hayat and talked with the personnel. And with a little more investigative work around and about Tripoli, I understood that Hayat was the daughter of Dib Chehade, the cook that had first made the soaps at Awaida’s factory in the 1950s. The soap was then sold in the 1960s to Hassan Barake and later to PM Mikati. According to some accounts, the cook Chehade named the soap Hayat after his daughter and according to other accounts, Chehade named his daughter after the soap. Which story was more true or less true did not matter, I wanted to find Hayat. With all excitement I tracked down Hayat’s son. When I finally met him, he very generously talked about his life and and about his dad’s life. I then asked about Hayat. With a blank look he said: Hayat led a ‘normal’ life. How can ‘normal’ be inspiring?! I thought with a sigh. He suggested I meet her when she was back from her travels. I then asked if perhaps he would share some old photos of her that I could probably integrate in my work. He explained that Hayat might not approve because she was veiled later in her life. I knew I would not ask about Hayat anymore. I preferred to leave her veiled in the intimacy of her own ‘normal’ life. I realized I could try to unveil only the ‘hayat’ in my hands. 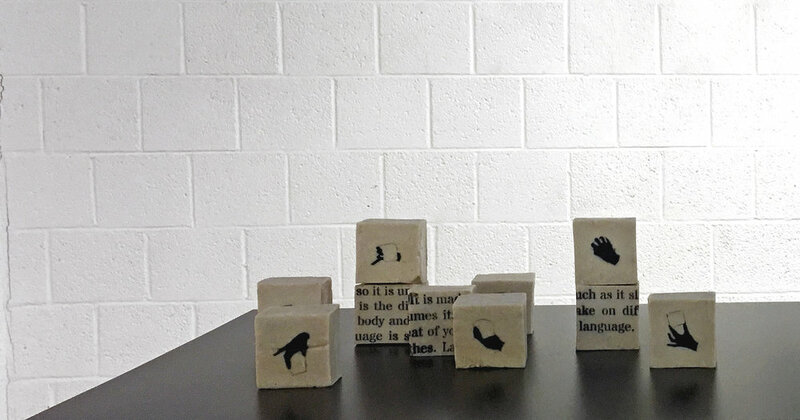 Christine Kettaneh, Proof that there is life in language and language in life, 2017, paint on soap, 6.5x6.5x4.5cm each, ed.3/4. In the ad, there is a hand holding the soap up with the tips of its fingers. Very elegantly. very lightly, so unlike how you would carry a rough brick-like heavy ‘saboon baladi’. Is it the name Hayat that allows that divergence? Life is soap, I think. It is made so it is unmade; it is worth all that consumes it; it is the dirt between your hands, the sweat of your body and the stains on your best of clothes. Language is soap, I also think. It clears as much as it slips; it is decorative; it is plain; it can take on different forms. Then there must be life in language. And language in life. As Ghassan Tueini says in his introduction to the book, there is life in every letter; every day the letter is born both young and old. So it is possible then that a hand can carry a bar of hayat, a bar of life that is simultaneously young and old, heavy and light.